Greenville, South Carolina is not just about the downtown area, our location close to the Blue Ridge Mountains, and with flowing rivers and lakes close by make this area a great place to live. Many people like to slow down, work less, spend less and have more free time for quality of life. 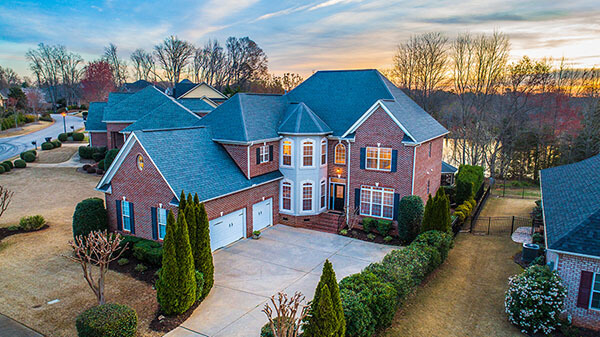 Homes in Travelers Rest accommodate this higher quality of life without sacrificing access to good restaurants, shops and activities. Travelers Rest is now enticing many younger residents to settle there because of these factors. TR is unique in that it has embraced a healthier and innovative way to appeal to younger residents, families and couples. Having Furman University in TR helps bring in a younger crowd, but the growth since the swamp rabbit trail opened has really catalyzed amazing shops and restaurants to open. This article will detail more about TR and the trailblazer park. Next month we will talk about all the amazing new restaurants opening in Travelers Rest. Just north of Greenville, in South Carolina where US-276 and US-25 unite for a short distance and then head off in different directions, nestles a place called Travelers Rest. The name itself conjures up a sense of peace and relaxation, a place to take a deep breath and put your feet up for awhile. The town takes its name from its location-in the 1800s, weary travelers coming down out of the mountains to sell goods or to travel to the coast, would stop here and take a breather before continuing to their destination. It was also the last stop before heading back up into the mountains on the way home. Sometimes those travelers had to wait months to allow the snow to clear. $479,900 | 4BR x 3.5BA | 3,400-3,599 S.F. Travelers Rest (TR), SC has always given weary travelers a respite-a place to stay for a day or a month, a place to rest and to restock their supplies. TR is not just a sleepy little town anymore. Today, visitors to TR do not need to go to the general store to restock their wagons with supplies or food (although people food is definitely available!) or find a place to repair a broken wagon wheel. They can, however, choose to restock their wagon with other items- like fun, adventure and enjoyment! Depending on your mood and your level of energy, there are a number of activities in Travelers Rest to explore. The two we’ll be taking off the shelf and adding to our wagon today -Trailblazer Park and the Swamp Rabbit Trail connection- are available anytime and, best of all, don’t cost a dime! Trailblazer Park is located on 22 acres on the southern side of downtown Travelers Rest (TR). Travelers Rest High School was located on this site until it was moved to a site on North Main St. in 2007. The school board’s plan was to use the property as a school bus hub, but TR’s visionary planners, including former mayors Roy Reynolds and Wayne McCall and city administrator, Dianna Turner, had a better idea. They wanted to take advantage of one of the best views in the area and make this piece of property a hub of activity for the community. And so Trailblazer Park was born. Trailblazer Park opened in the summer of 2014. If you need to take care of any town business, Travelers Rest’s City Hall, Police Department, Fire Department, and Summary Court are all located here. But the park is not all serious business! 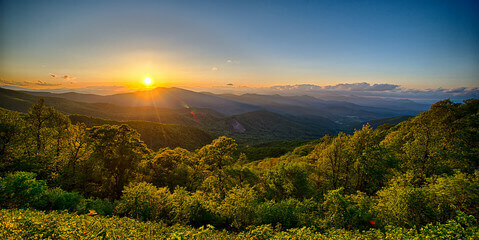 Step outside those offices and take in the view of the Blue Ridge Mountains to the north and Paris Mountain to the southeast. The park itself is a beautiful green-space with wide sidewalks equally suitable for an evening stroll or a more strenuous walk for exercise. The Travelers Rest Farmers Market Pavilion is located in the center of the park. Every Saturday morning, from May to September, this space welcomes 70+ vendors, making it the “largest, independently run, non-profit farmers market in the state” (quote from https://www.travelersrestfarmersmarket.com). Opening Day this year is May 4th, 2019. The Farmers Market, besides bringing fresh, local products to customers, also provides regular programs during the Saturday markets. Those programs include Market Music, Market Talks, Market Cooks, Market Kids, and Market Fitness. The May 4th programs include “Ask a Master Gardener” presented by Greenville Gardeners Master Gardeners, “Plant a Seed for Life” hosted by Market Kids, and a yoga class offered by Market Fitness. Check the website above for the schedule of events and fill your Saturday mornings with good food, fun and a bit of education. One program offering, which sounds particularly appealing, is the “Tomato Sandwich Taste-Off” on July 27th. This will be the 6th year for this event, which features 8 local restaurants competing for the “Big Tomato” title. Behind the Market Pavilion is the amphitheater. This year, the amphitheater will host “Music in the Park” every Saturday evening in May, June and September. A wide range of musical genres is represented so check out the schedule, and choose a night (or several) to enjoy this beautiful venue. Food vendors, food trucks, and a craft beer and wine kiosk will be available. Bring your lawn chairs or a blanket , but no pets, alcohol, hard-sided or large coolers. Another popular series in the amphitheater is “Movies in the Park” every Saturday evening in August. The schedule will be announced in June. The movies start around 8:30 PM. Food trucks will be open. Bring a chair and grab a spot! 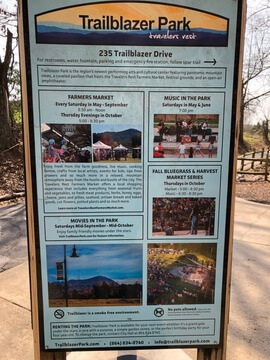 On Thursday evenings during the month of October, when the temperatures turn cool and the mountains are blazing with color, Trailblazer Park celebrates with the Bluegrass/Harvest Market. This event features bluegrass music in the amphitheater and family style dining. Local vendors and artisans also return to offer their wares at this market. Trailblazer Park hosts annual/biannual events too. Coming up on April 19-20 is the Vintage Market featuring over 100 vendors of vintage and handmade goods, along with food and music. The Vintage Market is also held in the fall, but that date has not been announced yet. On June 19, Chautaugua Series presents “History Comes Alive” with Leslie Goddard portraying Jackie Kennedy. Included in the Park’s 22 acres are Greenville County athletic fields, known as the Chico Bolin Athletic Complex. The former Travelers Rest High School football field, complete with lights and a ¼-mile walking track, remains on this site. On the southern side of the field, new trails, a concession stand, and bathrooms are being constructed. Trailblazer Park offers something for everyone. As a visitor, you can enjoy a solo walk around the park’s trails, attend a concert in the amphitheater, buy local food and wares at the Farmer’s Market, or do business with the city. Or all of these on the same trip! Another bargain in TR is the Swamp Rabbit Trail. 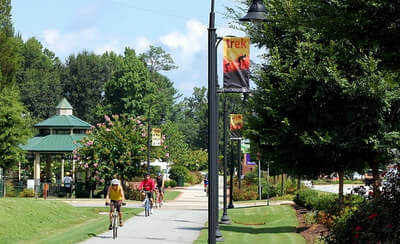 The Swamp Rabbit Trail (SWT) is a 20+-mile long (and growing) paved trail, which runs through Greenville County. The SWT sits on the old rail bed for the Greenville and Northern Railway-one of many names this railway had over the years. The railway’s nickname, though, was the Swamp Rabbit, because the line ran along the Reedy River and the ride, evidently, bounced passengers around, just like its namesake’s hopping gait. And, as with many nicknames, Swamp Rabbit was the name that stuck. In 1998, Upstate Forever saw the potential in converting the section of the abandoned line from Greenville to Travelers Rest to a public trail. The group spearheaded acquisition of the property and the eventual partnership between Greenville County Parks, Recreation, and Tourism and Greenville Health System, and the opening of the “Greenville Health System (now Prisma Health) Swamp Rabbit Trail” in 2009. Since then, it has grown to its current 20+ miles and runs from just north of Travelers Rest to Lake Conestee Nature Park south of Greenville. You can find an interactive map of the SWT online or you can pick up a hard copy at Travelers Rest City Hall. Over 600,000 bikers, runners, and walkers used the SWT in 2016. The SWT closely parallels Travelers Rest’s Main St and has helped to transform the downtown area from its former status as a place to pass through to its current repute as a “hopping” destination. The eastern portion of Trailblazer Park lies very close to the SWT. A short spur across from City Hall allows easy access to the trail. From there, it is an easy 0.8 mile hike, run, or bike ride to downtown TR and all the food and entertainment available there. This portion of the trail is popular with families, with people walking pets (and pets walking their people! ), runners, and bikers. With so many different types of users, rules to keep everyone safe do exist. Those rules include staying to the right if you are a walker or runner, to the left if you are a biker. Trail etiquette calls for bikers to warn pedestrians of their presence by ringing a bell or calling “on your left!” Pedestrians, though, also need to remain aware and keep one ear open for approaching bicycle traffic. Optimum health is built on many things, including ample rest and relaxation, physical activity, healthy food, and emotional and spiritual activities that feed our souls. Travelers Rest remains a wonderful place to seek peace and quiet, but has also transformed itself into a place to be active and involved. From the Farmer’s Market at Trailblazer Park, where local produce is available for your purchase, to the Swamp Rabbit Trail, where you can stretch your legs with a gentle amble, or push yourself a bit with a bike ride or a run, Travelers Rest provides many options for helping you become the best you can be. Talk about lightening up... Nanoleaf, a unique lighting company, has developed hexagonal smart light panels. Arranged in endless combinations you can create programmable art and light. Set it to react to touch or music! $250 for 9 tiles available later this year. Planning a new yard design to update the current one? Curb appeal is top on the list with new buyers. The app Home Design 3D Outdoor & Garden can help you with that!. 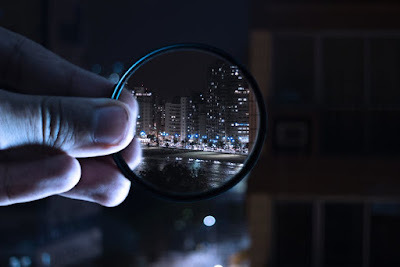 The NAR blog for ABR credentialed realtors (which Lee is one) recommend it! What are basic Spring DIY Cleaning Supplies? General things about cleaning supplies, Cleaners rely on either acids or bases. When combined they cancel each other out so pick one or the other, but not both for the same job. Did you know that mixing bleach & vinegar OR ammonia creates HIGHLY TOXIC chlorine gases NEVER MIX THESE. Mixing hydrogen peroxide can cause an EXPLOSION! Borax is an excellent cleaner, but TOXIC. Acid can etch the surface of any stone (granite, marble, etc). White Vinegar - (acetic acid) Has a slight smell at first which goes away quickly. It's a great all purpose cleaner. Do Not use the apple cider vinegar for cleaning purposes! Lemon juice - (citric acid) This acid does all of the above, but smells much nicer. Baking soda - A safe and gentle alkaline base. Germs can't survive around this much base. Bleach - Does not play well with others. Only add water!!! List Price $179,900 | 3BD x 2BA | 1,400-1,600 s.f. Yes, Just Listed and Just Closed. That Fast! by far exceed my expectations of the entire home selling process. The property was such, that a particular type of buyer was needed, and found. Also, the LC team in no way impeded a temporary lease of the property that extended the time frame by 5 months, but ended up with a closed deal! My thanks to all of you!" What's SOLD in YOUR neighborhood? 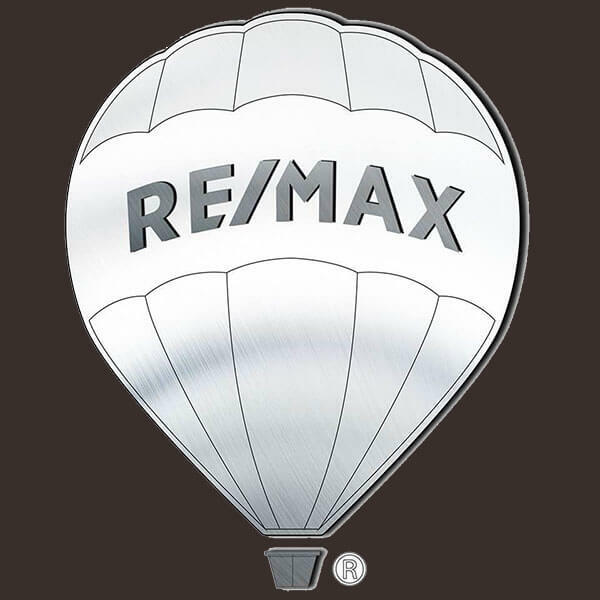 Get active, under contract and sold homes report for the ANY neighborhood. Be better informed about selling prices for properties and your future home.